Easter has come and gone. This is the week after Easter and we are rejoicing in all the of the joy and promise and hope that the resurrection brings. Every year, I find myself thinking about what those days and hours must have been like for Jesus’s people as they walked that journey with him. His friends, the 12 Disciples, his followers, his family, HIS MOTHER (oh, sweet Mary)…what must that have been like? For us, we know that what they were experiencing was just a wait. It was “the meantime,” it wasn’t the end. But to them, it probably felt EXACTLY like the end- and not a good one. They loved Jesus deeply and believed in him with all of their hearts. It was no small thing for them to have put their lot in with this Renegade Rabbi, he was a bit of a polarizing figure. They had staked EVERYTHING on the belief that he was who he said he was. Many, probably most, perhaps even all of them had in mind their own version of what this King’s victory would look like and hanging to his death on a cross, mocked and scorned, was not it. This didn’t work out like they had thought. Where did this leave them? Obviously, two millennia later, we have the answer to that question. Breathtakingly and excruciatingly beautiful, the rest of the story is, for us Christians, the single most sanctifying, perfecting, and hopeful event in all of history. But the meantime…how many of us have experienced a “meantime” in our lives that actually felt like an end? The friendship we had spent years cultivating that fractured, leaving a hole in our life and heart. The pregnancy we had spent years praying and trying for that did not end with a baby in our arms. The marriage we had invested our whole heart into that ended in hurt and betrayal. The job we wagered our entire financial security on that dissolved and left us adrift. It feels like an ending. And a BAD one. Not good or holy or what we felt we had been promised as we walked in faith. But the story of the Resurrection reminds us that God is NEVER done with the story. Those hours after the crucifixion must have felt like the end to those who knew and loved and followed Jesus, but it was most certainly NOT the end. It was actually the meantime. 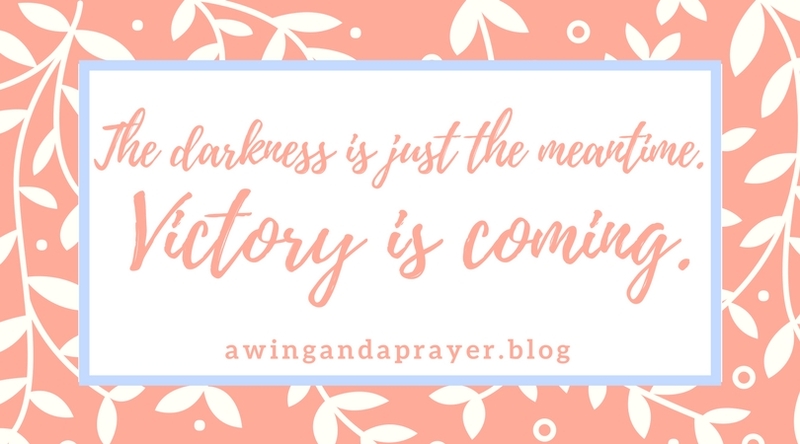 The miracle of the Resurrection and the truth of what that Jesus’s people went through in that season gives us a promise to which we can cling FIERCELY in the dark moments that feel like an ending in our life. God’s ending is always victory, even in death. And it doesn’t mean that we won’t carry scars from our journey. After the resurrection, Jesus’s hands and side carried the wounds of the crucifixion. But the promise we have is that through Jesus, beauty will come from the ashes, the scars will sharpen and shape us into more of who and what He created us to be and whatever “meantime” we walk through will become a part of the beautiful fabric God is weaving in our life. For us, darkness is the just the meantime. Victory is coming. Let’s walk through the coming weeks and months with that lens fixed to our eyes and hearts. He is risen indeed. Alleluia!